A United statement said the procedure "had gone very well" but Ferguson "needs a period of intensive care to optimise his recovery". Ferguson's family have requested privacy as he recovers in Salford Royal Hospital. "We will keep Sir Alex and his loved ones in our thoughts during this time, and we are united in our wish to see him make a comfortable, speedy recovery," United later said in a tweet. 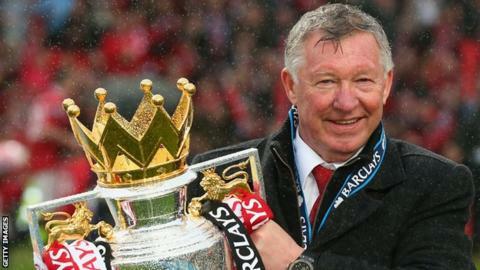 The most successful manager in the history of the British game, Ferguson's trophy haul at Old Trafford included 13 Premier League titles, two Champions League crowns, five FA Cups and four League Cups. United's club captain Michael Carrick said he was "devastated" to learn his former manager had needed emergency surgery. "All my thoughts and prayers are with him and his family. Be strong boss," he wrote on Twitter. Ferguson began his playing career with Scottish club Queen's Park as a 16-year-old striker whilst working as an apprentice tool-worker at Clyde Shipyards. His most notable spell as a player came in a two-year stint at Rangers from 1967. He retired as a player in 1974 when he was on Ayr United's books. Ferguson moved on to Aberdeen and turned them into a major force in a Scottish top division in which Rangers and Celtic had dominated. He led them to three Scottish titles, four Scottish FA Cups, one League Cup and the European Cup Winners' Cup in 1983 by beating Real Madrid 2-1 in the final. Ferguson managed Scotland in the 1986 World Cup in Mexico following the death of Jock Stein, although he was unable to take his country past the group stage. He became Manchester United manager later that year. United celebrated their first Premier League triumph under Ferguson in 1993, the club's first league title for 26 years. Willie Miller, who served as Aberdeen captain under Ferguson, said he was "staggered" to hear the news. "My thoughts are with the boss, Cathy and the boys. Hoping the great man does what he does best and wins this challenge," he added. Everton manager Sam Allardyce said: "I hope he's in good hands and I hope the operation is a major success. As a personal friend, I hope he has a full recovery." Former Manchester United midfielder David Beckham: Keep fighting boss. Sending prayers and love to Cathy and the whole family. Mike Phelan, who was Ferguson's assistant for five years: You've won more than most and if anyone can, you can boss. United defender Ashley Young: Gutted to hear the news tonight about Sir Alex. Don't really know what else to say other than thoughts and prayers with you and your family, boss. Former United goalkeeper Edwin van der Sar: Devastated about the news about Sir Alex and knowing all too well about the situation ourselves. Stay strong and hope together with everyone you recover. United defender Chris Smalling: Gutted to hear the news about Sir Alex. Stay strong boss. Thoughts are with you and your family. Former England striker and Match of the Day host Gary Lineker: Very sorry to hear the news that Sir Alex Ferguson is seriously ill in hospital. Wish him all the very best. Aberdeen FC: The thoughts and prayers of everyone connected with Aberdeen Football Club are with our former manager Sir Alex Ferguson and his family following tonight's news. Liverpool FC: A great rival but also a great friend who supported this club during its most difficult time, it is hoped that Sir Alex will make a full recovery. Manchester City: Everyone at Manchester City wishes Sir Alex Ferguson a full and speedy recovery after his surgery. World football governing body Fifa: We join many across the world of football in sending our best wishes to Sir Alex Ferguson.